Why knowing body fat percentage is important! We always assume “Fat” is bad for health, well that’s not true, It is one of the three important macro nutrients, fat protects your internal organs, provides you with twice the energy you get from carbs. So, Fat is good but only when its consumed in small maintained proportion (its very tricky thing to do). It’s tough to calculate, tough to track, and most people are way off in their estimates of what they think their body fat percentage is, most of them don’t even care about it. Then, What is body fat percentage then? Well, body fat is the amount of fat in your body, compared to everything else. Everything else includes your organs, muscles, bones, tendons, water, and so on..
Moving further, Did you know there two types of fat good and bad! Good as in essential fat means the minimal amount of fat required for survival. So anything less then required amount can cause harmful damage to organs. That’s the reason bodybuilders, who can minimize their body fat to the “essential fat” level only do so when prepping for a show – during the rest of the year they maintain a higher body fat percentage so that they can stay healthy and function properly. Word of Caution : If you are amoung Obese or Upper Average category then it is advisable that you should decrease body fat percentage to benefit your health. If you want a body like John Abraham or Priyanka Chopra then good luck! You should be targeting body percentage upto 6–9% for men and 18-20% for women. If you are interested in getting that ripped six pack, drop your body fat down to the 8-11% range for dudes and 15-17% range for women. If you are an athlete and interested in optimal athletic performance, aim for a body fat percentage around 15% (men) or 20% (women). Below, you’ll see images of what people look like with different amounts of body fat. 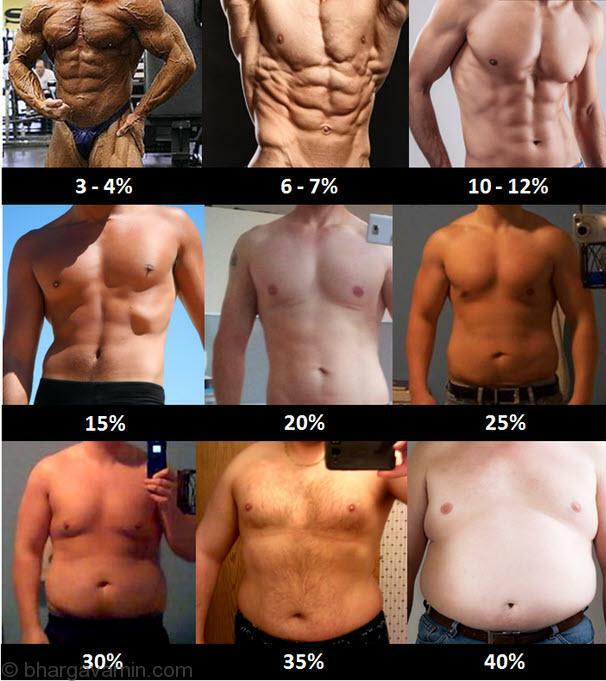 Ways to calculate body fat percentage! Body Fat Calipers – Pick up a set of calipers for $5. Pull the fat away from your muscles, pinch them with the caliper, take the measurements, and look at a chart to figure out your body fat percentage. Some recommend using one test site, some multiple. In my experience, I have found that these calipers tend to underestimate body fat percentage (mine tell me that i’m 9 or 10% when I’m really 12%, and Staci’s say she’s 17% when she’s more like 20%), but are surprisingly accurate considering how cheap they are. Body fat scales and monitors – An electrical current is sent through your body and uses “biometrical impedance analysis.” I don’t really like this method, as I find the number that it spits out to be horribly inaccurate; because they send an electrical current through your body, the amount of water you are carrying can drastically adjust this number. Hydrostatic Weighing – This method is considered the “Gold Standard” (+/- 1.5% error) of body fat measurement that requires being submerged in a specialized tank of water. Because bone and muscle are more dense than water, a person with a larger percentage of fat free mass will weigh more in the water and have a lower percent body fat. Conversely, a large amount of fat mass will make the body lighter in water and have a higher percent body fat. Anthropometric – This method uses body circumference measurements to estimate body fat percentages. The U.S. Navy method takes waist, neck, and height circumference for men and hips, neck, and height for women. DEXA Scanning– This is considered the most accurate method, as it actually takes a full dual X-ray of your body composition and gives you numbers. You can get this done at a health facility, and involves you lying on an X-Ray table for about 10 minutes. It’s typically expensive, anywhere from $50-150 per session depending on where you are located. It comes down to this: Look in the mirror: do you like how you look? Awesome. Do you NOT like what you see? Follow the advice in the next section. Things to do in-order to control and decrease your body fat percentage! Eat a caloric deficit – Although I believe there is more to it than just this, in order to lose weight, you need to be eating a caloric deficit – burning more calories than you consume. If you are not strength training and still consuming lots of carbohydrates, you will most likely be losing muscle along with fat, which is not optimal but will help you lose body fat. Lift heavy things – When you do strength training with heavy objects (or intense body weight training), you get stronger and keep the muscle mass that you already have. On top of that, you also push your metabolism into an “afterburner” effect which burns extra calories even after you are done working out. Sprints – When you run sprints, you create a similar afterburner effect with strength training, meaning extra calories burned after the completion of your workout. Eat less than 100 grams of carbohydrates per day – When you deprive your body of carbohydrates, it no longer has steady access to its preferred source of energy, sugar (which all carbs become once they’re consumed and processed by your body). It now has to pull from fat storage to fuel itself. There are many more ways to do this. I would suggest to keep your diet minimum avoid unhealthy stuff, keep a note of everything . Specially will recommend my readers to install one of the MyFitnessPal app its has many good features where you can input your diet, set goals and monitor body nutrients.